On August 15, Anna Hazare slipped in quietly at Rajghat to sit on the lawn at the feet of Mahatma Gandhi and immerse himself in deep meditation. There was this 74 year old simple man clad in white quietly sitting on a green lawn unaware of the surroundings. Slowly and peacefully walkers-by and people around there started gathering. Mindful of his meditation, they gave him plenty of space and respectfully sat down on the grass without uttering a word. Within a short period of time there were hundreds of people all around this man, all sitting quiet. It was the best spectacle of leadership I have witnessed all my life. The incredible power of character of a single human being with his magnetic pull to captivate and motivate others without speaking a single word. Gandhi lived before my time. I am not fortunate to witness and experience him directly while he lived. All the books I have read about him including his auto-biography are not adequate to really know him. I can only imagine him through Anna Hazare. Corruption instigated by the government is like a sewage being dumped into a fresh body of water like a lake (our nation). The sewage dements and deforms every creature in the lake and forces it to behave abnormally. The solution is not to blame everyone and create a state of paralysis. The most urgent step is to stop the inflow of sewage. For the past several weeks I have been watching carefully the cat and mouse game the UPA government has been playing with Anna Hazare. All of you are very well familiar with the recent set of events. I think we should revisit and analyze our role in it. It is said that truth is like a mirror. If we face it we see our real face in it. One can weave all the convoluted logic in the world, but it all falls flat in front of the truth. All the arguments put forth by the UPA government over past several months to discredit Anna Hazare and his movement have bit the dust. They did not fool even the least educated and most un-empowered void of the information base we are privy to. The UPA government has lost all its credibility in the process. 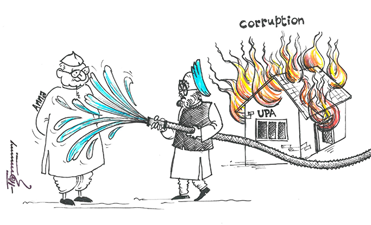 Even Dr. Manmohan Singh has lost his once exalted status as Mr. Clean. It is a pity to watch his image soiled by the compulsions imposed upon him by his party and bad advice being offered to him by his arrogant colleagues. He may lose forever his most prized possession – his integrity and clean image – if he does not do some soul searching and take some bold steps to save himself. The loss he faces is bigger than just prime-minister ship. It is his place in history. Let us restate the fundamental issues here. Corruption is running rampant and wild in India. It is the root cause of most of our problems including poverty and lack of education faced by over 37 per cent of our fellow citizens. Our government(s) - current and in the past - is the biggest single instigator, perpetrator and perpetuator of corruption in the country. Corruption is permeated deep in its political and bureaucratic system. This does not absolve the private sector and the public for participating in corrupt practices. But there is a big difference between the two. Let us revisit the analogy given by me earlier. Corruption instigated by the government is like a sewage being dumped into a fresh body of water like a lake (our nation). The sewage dements and deforms every creature in the lake and forces it to behave abnormally. The solution is not to blame everyone and create a state of paralysis. The most urgent step is to stop the inflow of sewage. The ecosystem of the lake will slowly recover from the pollution. This will require re-evaluation and re-engineering of our value systems which have been badly damaged by the corruption. But for now, we have no choice but to stop the inflow of sewage! In our democratic system parliament is the sole vehicle to create new laws and amend the existing ones. It has been doing so over the past six decades. It is also infested by a majority of members who are corrupt. We have a fundamental problem here. The very people who are known to be corrupt are charged with the responsibility to introduce and pass legislation against corruption. It is a clear conflict of interest. I go back to the original question raised in the title of this article. How can a body corrupt in itself, cure itself by itself? We can’t keep repeating meaningless solutions in futility. We have been told that if you do not like the majority of members in the parliament, then vote them out in the next elections. We are also told that if you protest against what is being proposed to fight corruption by the members of the parliament, then you are interfering with the due process which amounts to blackmailing the parliament. It is like the demented and the deformed creatures in the lake who are victims of the sewage, being told to keep devouring it since they have no provisions to stop the source of the sewage. I was amazed to watch a newscast on the TV that Anna Hazare was blackmailing the government from Tihar jail. He was making demands for protest without conditions and Delhi police was being forced to concede to his wishes. It is appalling to hear that. Anna Hazare was claiming his basic rights guaranteed by the constitution to him: the right to hold peaceful demonstration and voice your protest against the actions of the government if you do not agree with them. Why does he have to ask for it? Who are Delhi police (Home Ministry and the UPA Government) to grant it to him point by point? The constitution guarantees it to him. The mirror of truth for the government is laden with the dust of corruption to the extent that they cannot see the basic rights of a citizen of India guaranteed by its constitution. We can roll over and play dead. We are good in that. We have been doing it for the 40 plus years on corruption issues. There is an alternative! Staying within the constitution and through peaceful means apply intense pressure on the parliament to consider an alternative and more effective Lokpal Bill along with the one proposed by the UPA. The parliament in an effective democracy should be transparent like a fish bowl. Its actions must be visible from every direction. Every member of the parliament must be held accountable for his/her actions within the parliament. Whatever may emerge as the eventual Lokpal Bill, should be thoroughly and openly debated with full briefing to the public and voting record of each parliament member on it should be recorded and made public. This is what Anna Hazare is doing. He has the integrity, character and the courage to risk everything in the process. He is making our democracy strong that we can feel proud of. This is why he has the masses attracted to him because they see their salvation in fighting against corruption through his leadership. I have high regards for your views and you as a person of very high integrity during your public life. I am sure what you state here is well thought out by you. Each situation is different. Even democracies from one country to another are not the same. There is a large framework within which various versions of genuine democracy have been functioning and can function. The challenges for India are unique to India and require genuinely creative solutions. I am not in favor of a blanket approval of the Jan Lokpal Bill. However, I find the government’s version of Lokpal Bill very repulsive and consider it as an insult to the intelligence of an ordinary Indian. There are still others who believe we do not need a Lokpal. All we need is better enforcement of present laws. However, they do not offer as to how that can be done in the present state of affairs. Any suggestion that is not solution oriented is a mere intellectual exercise. It helps shape our views but offers no remedies. In a nut shell I find Lokpal, as stated in the Jan Lokpal Bill, no more than an independent prosecuting body. The existing judicial system will decide the guilt or innocence and determine the extent of punishment. With CBI, all of it, under the government, we do not even have an effective prosecuting body. All current prosecutions of the well known scams are being conducted under the pressure from SC, and are not voluntarily driven by the government. We just had a high court judge impeached by the Rajya Sabha. This was the first case in the history. Yet we know how many HC and SC judges with known corrupt background are roaming free. Furthermore, we have no provision to prosecute the currently impeached judge for his criminal conduct. He is impeached but walks free. This further underscores the need for a Lokpal. I cannot take each of the excellent observations you made and answer them. To begin with there are no simple answers and this is not the detailed forum to accomplish it. As I stated in the article, both versions of the Lokpal Bill should be introduced in the parliament. There should be an open debate about them. The parliament should be kept under intense public scrutiny (they chose to be elected for this coveted responsibility and are accountable to the people) as the debate is carried on and the eventually voting takes place. Whatever comes out as a result should be acceptable to all of us. This is how things should play out in an effective democracy. A well written article on the emergence and exit of corruption. However, I am not sure WHAT civil society means by a stronger Lokpal. Will the inclusion of entire bureaucracy, private enterprise, parliament, P. M. and judiciary not make it unwieldy and less effective. If it were confined to high political leadership, top echelons of bureaucracy, N. G. Os.and private enterprise it can be expected to do its job effectively. P.M. should be given freehand to act during office as he has to handle emergent national issues. He can be held responsible to Lokpal for his actions after demiting office. In no democracy acts of M. Ps. within parliament are controlled by persons other than the speaker and its members. Judiciary needs much more control than lokpal alone and the issue needs to be settled through a more thorough legislation which may not be struck down by judiciary. Beautiful article Dad. I have faith in India and her people. We will work our way out of the trappings of our early years.